International collaboration led by Nagoya University uses two-dimensional antiaromatic materials to realize three-dimensional aromatic structures. Nagoya, Japan - Aromatic molecules consist of planar carbon-based rings with alternating single and double (π) bonds. These molecules contain 4n+2 (n = 0, 1, 2 ...) π electrons--π electrons are those involved in π bonds--which results in high stability because the π electrons delocalize over the ring structure. Aromatic molecules can interact through offset π-π stacking, and the overlap of π orbitals in aromatic structures with π-π stacking can facilitate electron conduction, making such materials attractive for use in electronics. The overlap between π orbitals would be increased if π-π stacking was face-to-face rather than offset. However, face-to-face stacking is energetically unfavorable in aromatic molecules because of the repulsion of π electrons. Theoretical studies have indicated that face-to-face interactions between molecules may be achieved using antiaromatic materials. Antiaromatic molecules contain 4n (n = 1, 2 ...) π electrons, which makes them highly unstable. 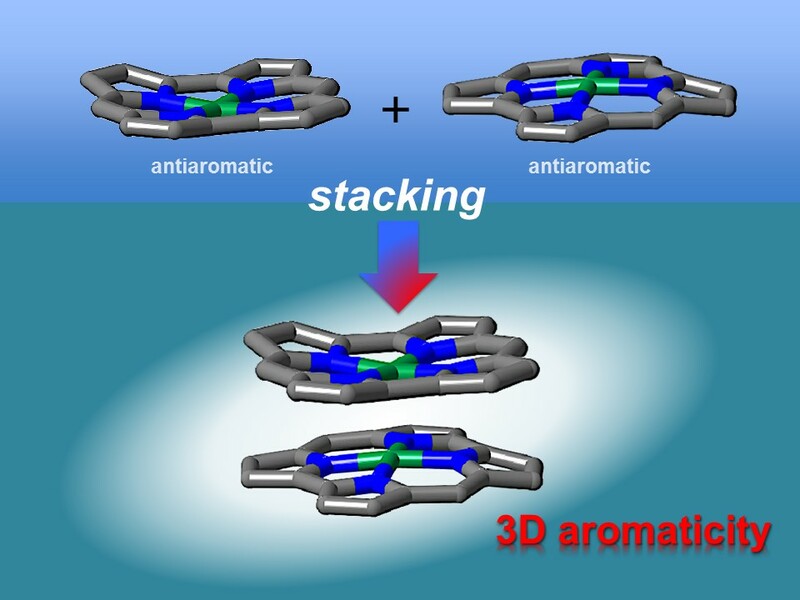 It has been postulated that the two-dimensional stacking of antiaromatic materials may result in the formation of materials with three-dimensional aromaticity. However, this had not been verified experimentally as antiaromatic materials are difficult to synthesize because of their instability. Recently, an international collaboration led by researchers at Nagoya University achieved a breakthrough in two-dimensional stacking of antiaromatic materials. They synthesized nickel complexes of antiaromatic planar norcorrole macrocycles. The study was reported in Nature Communications. "We synthesized stable antiaromatic nickel norcorroles and then investigated their interactions," first author Ryo Nozawa says. X-ray diffraction analysis showed that the norcorrole complex stacked to form a "triple-decker" structure with the norcorrole planes much closer together than observed for typical π-π stacking interactions. The triple-decker structure displayed aromatic characteristics, unlike its norcorrole subunits. The researchers then fabricated a molecule containing two antiaromatic norcorrole units linked by a flexible bridge. "Our characterization results indicate that the two norcorrole units assume face-to-face interactions to form a molecule with higher aromaticity than that of the norcorrole subunit," coauthor Hiroshi Shinokubo explains. "That is, there is strong three-dimensional electronic communication between the norcorrole subunits." The stacking of antiaromatic units gave closer interactions than that achieved when stacking aromatic units together, corroborating theoretical predictions. The resulting materials had extremely close π-conjugated systems, which should result in large intermolecular orbital interactions. As a result, these materials are interesting for application in optoelectronics. The researchers also found that the stacked antiaromatic materials displayed nonlinear optical properties that were regulated by the formation of supramolecular structures. A material has nonlinear optical properties when it does not respond linearly to the electric field of light. Such materials are attractive for use in nanofabrication and photodynamic therapy, suggesting possible future applications of norcorrole-based compounds. The article "Stacked antiaromatic porphyrins" was published in Nature Communications (DOI: 10.1038/ncomms13620). Authors: Ryo Nozawa, Hiroko Tanaka, Designated Associate Prof. Ji-Young Shin, Prof. Stephan Irle, and Prof. Hiroshi Shinokubo, Nagoya Univesity, with their international research group including Yonsei University (South Korea) and Western Washington Univesity (USA). Funding: This work was supported by the Grant-in-Aid for Scientific Research on Innovative Areas (2601): π-System Figuration, JSPS KAKENHI grant, and the Program for Leading Graduate Schools 'Integrative Graduate Education and Research in Green Natural Sciences' from MEXT, Japan, and others.